Given his evident difficulties with basic foreign affairs knowledge, it's unlikely that President Donald Trump had heard of the Britain First political party when he decided on Wednesday morning to promote three anti-Muslim videos the group posted to Twitter. Nonetheless, his retweets cast a light on the central role that hostility to Islam now occupies in far-right movements worldwide. In essence, antipathy and fear of Muslims has become the ideological glue that is allowing more secular forms of white nationalism to fuse with Christian supremacism in many countries, including the United States. Britain First is perhaps one of the best examples of this trend. The group is an offshoot of the British National Party, a right-wing extremist group with fascist overtones that formally banned nonwhite people from joining until it was forced in court to rescind that policy in 2009. Britain First was founded in 2010 by Jim Dowson, a former fundamentalist Calvinist who was ejected from the BNP after he was accused of groping a fellow party member. The group deliberately patterned itself after the Irish Republican Army and even has its own paramilitary wing which trains members in "knife defense." The party has become even more notorious in recent years, after Thomas Alexander Mair, the convicted murderer of Jo Cox, a Labour Party member of Parliament, was reported by multiple witnesses to have screamed "Britain First" before he shot and stabbed Cox in June of 2016. Britain First disavowed Mair and denied any connection to the act, although it had boasted of its knife training just four days earlier. The controversy over Cox's death has not stopped the party from engaging in repeated "Christian patrols," in which members burst into mosques screaming and passing out Bibles. Britain First has also publicly boasted that its members would stalk public officials and political candidates who are Muslim, supposedly to determine if they have ties to terrorist organizations. "Our intelligence led operations will focus on all aspects of their day-to-day lives and official functions, including where they live, work, pray and so on," the party wrote on its website, according to the Daily Telegraph. Despite its failure to win any of the elections for which it has fielded candidates, and its tiny dues-paying membership, Britain First has developed a large online following. Nearly 2 million people have "liked" the group on Facebook as of this writing, a direct parallel to the small but web-savvy "alt-right" movement of white nationalists in the United States. Trump does not follow Britain First or Jayda Fransen, its most prominent representative and the source of the tweets he quoted. Far-right columnist Ann Coulter does, however, and hers is one of the few Twitter accounts that Trump personally follows. 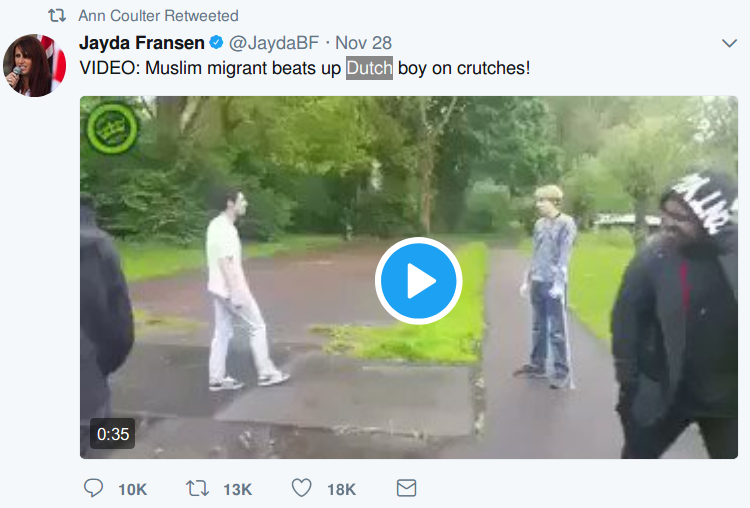 Just a few hours before Trump promoted Fransen's clips, Coulter had retweeted one of them. That Coulter would promote something from Fransen is no surprise, considering that Coulter has frequently attended white nationalist events in recent years. She has also been increasingly open about sharing opinions that are difficult not to characterize as anti-Semitic. Coulter's repeated expressions of bigotry against Muslims predates all of that, however. Her post-9/11 opinion column urging President George W. Bush to "invade their countries, kill their leaders and convert them to Christianity" while avoiding "punctilious" concerns about carpet-bombing civilians is still her most infamous example of this tendency. Trump's own antipathy toward Islam is also no secret. "Islam hates us," he told CNN's Anderson Cooper in March of 2016. After claiming that he was actually opposed to "radical Islam," Trump went on to say that he didn't think one could really differentiate between a Muslim who was violent and one who wasn't. "It's very hard to define," he said later. "It's very hard to separate. Because you don't know who's who." That logic appears to have been the basis for Trump's December 2015 call for a "total and complete shutdown of Muslims entering the United States," a proposal he repeatedly described as a "Muslim ban," until his attorneys told him that doing so lessened the chances that his proscription on travel or immigration from several Muslim-majority countries would survive in court. Shortly thereafter, he began calling it a "travel ban" instead. Judging from his numerous statements against Islam, it would appear that Trump believes his own anti-Muslim rhetoric. His passion for bigoted statements against a major world religion and the roughly 1.8 billion people who practice it is clearly in line with the viewpoints of his former strategic adviser and campaign CEO, Steve Bannon, who has repeatedly warned that the "Judeo-Christian" world is in a "clash of civilizations" against Islam. Whether motivated by Christian fanaticism, racism, hawkish foreign policy views or a simple desire to find a replacement for the role of global villain once played by the Soviet Union, right-wing politicians worldwide have latched on to the idea of attacking Muslims for electoral gain. While Trump, Britain First and Coulter have used exceptionally coarse language about Islam, their view that Western nations are in a worldwide death struggle with followers of Muhammad is mainstream among many on the political right. Promoting fear of Muslims and terrorism has been a staple of far-right parties in many European countries, including France's National Front, the Alternative for Germany Party, the Freedom Party of Austria, the Party for Freedom in the Netherlands and numerous others. This apocalyptic vision is also extremely common among many Republicans in the United States, even if Trump's blatant bigotry often overshadows theirs. “This is a clash of civilizations and either they win or we win," Florida Sen. Marco Rubio said in November of 2015, as he challenged Trump for the GOP nomination. "They hate us because of our values. They hate us because young girls here go to school. They hate us because women drive. They hate us because we have freedom of speech, because we have diversity in our religious beliefs. They hate us because we’re a tolerant society." While Rubio and others, with varying degrees of sincerity, cite Western-style societies' greater freedoms for women and minority groups as justification for military interventions in Islamic countries, many within the global Christian nationalist movement have begun to cite religious and racial justifications. For several years now, many members of the religious right have hyped concerns about "demographic winter," the hypothesis that Christianity will die out in the Western world due to low birthrates and high immigration from Islamic countries. More recently, the idea has been recycled by the more secular "alt-right" under the concept of "white genocide." Trump himself toyed with the notion in February of 2016, when he retweeted a white nationalist account with the name "WhiteGenocideTM" which claimed to be posting from "Jewmerica." As with other white nationalists Trump has promoted on Twitter, Fransen of Britain First responded ecstatically to her moment in the spotlight in an all-caps post referring to herself in the third person: "THE PRESIDENT OF THE UNITED STATES, DONALD TRUMP, HAS RETWEETED THREE OF DEPUTY LEADER JAYDA FRANSEN'S TWITTER VIDEOS! DONALD TRUMP HIMSELF HAS RETWEETED THESE VIDEOS AND HAS AROUND 44 MILLION FOLLOWERS! GOD BLESS YOU TRUMP! GOD BLESS AMERICA! OCS"
The "OCS" reference at the end of her tweet is an abbreviation for "Onward Christian Soldiers," according to the British newspaper the Independent. Not all conservatives are comfortable with such rhetoric, it must be pointed out. British Prime Minister Theresa May, leader of the U.K.'s Conservative Party, strongly condemned Trump for sharing Fransen's tweets. "British people overwhelmingly reject the prejudiced rhetoric of the far right which is the antithesis of the values that this country represents -- decency, tolerance and respect," she said through a representative. "It is wrong for the president to have done this."